In a heavy bottom pan mix ingredients 1 through 5. Heat it on a near boil 180º F. Cook for about 20 minutes to 30 minutes. Continuously stir to prevent scorching. It should look like a ball of dough consistency. Let it cool off so you can handle it. Now make about 1" diameter balls. Press down into patty shapes. Sprinkle pistachios and almonds. Press down. Let the dish cool and store in the refrigerator. yummmm; you're right for choosing the version on the stove top rather than the microwave. The final taste and the texture is finer than when done with the quick method of cooking in a micro-oven. I 'm sure the result is worth the cooking time. has come out perfect! Anything done slowly always has a nice refined taste.This looks so good! Yummy pedas, i love them!!! 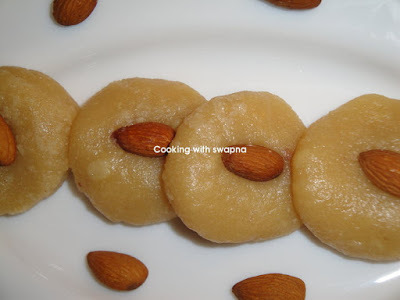 Lovely pedas Swapna....like ur stovetop version....looks delicious. 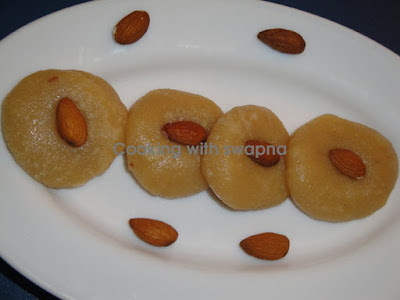 Lovely peda swapna..i love milk peda... nice one..
wow lovely pedas swapna ! these pedas look absolutely irresistible!! wish i had a few on hand now. ... gorgeous pic. Looks perfect and delicious... Making it with out khoa is a nice tip! The pedhas look absolutely scrumptious, I can never resist pedhas either...I have tried the microwave version of pedhas will try this the next time ! the pedhas look delicious...I've made them once before using a similar recipe...after toiling for a long time and with just 7 pedhas, I swore I will never make them again! peda without khoya!! thats sounds so easy and yummy too!! wonderful click..am drooling over this..you have got some cool recipes here..nice blog!